Harriet Harman’s revelations that she believes she would have beaten Ed Miliband in the 2010 leadership campaign was a bittersweet moment for a Labour feminist like me. The fact that Harman did not even think to stand, as women so often throughout history haven’t, is just sad. “There was no sense anywhere, as there often is with women, that I was leadership material. That it’s very easy to see men as leadership material. Somehow it’s more difficult to see women as leadership material, and therefore you’re being counter-intuitive as putting yourself forward. It was counter-intuitive in a way for me to be putting myself forward to be deputy leader, let alone leader of the opposition,” she said. On the one hand, that one of our party’s greatest ever women – the architect of all-women shortlists and key equalities legislation – thinks that she could have won that vote and feels confident enough to now say it should serve as a rallying cry. And this is, perhaps, why she is speaking out now: to tell all those who might consider it that they should go for it. No woman has ever beaten a man before in a Labour leadership contest. 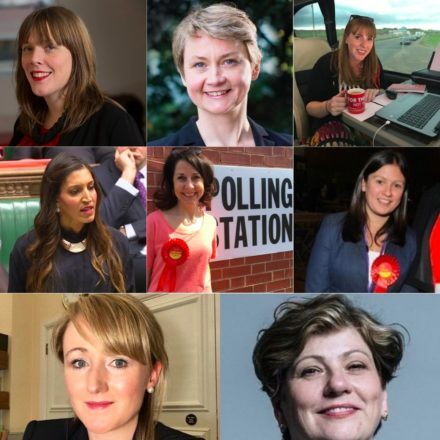 And, while Jeremy Corbyn’s position is completely secure after June’s gains, there is no harm in taking stock of some of Labour’s key female figures. Women are all too often not thought of as easily as leadership material, so to rectify that a little, here’s an exploration of who could one day take the top job. The shadow foreign secretary has won fans from across the party’s broad church with her strong performances at prime minister’s questions when deputising for Jeremy Corbyn. Backed by trade unions for a big role in future, she nominated her Islington neighbour Corbyn in 2015 and Ed Miliband in 2010. Clearly a highly intelligent and an increasingly bullish media performer, Thornberry is being talked of more as a future leadership candidate. Whilst only elected in 2015, Rayner has been impressive across many areas of political life. She’s great on television and radio, has been quickly promoted to the role of shadow education secretary, and is liked by many in the Labour party membership. The decision to give an interview to the Huffington Post in which she praised Tony Blair’s government was a bold move from someone so closely associated with Corbyn’s leadership – but it showed her as a unifying voice. Her backstory as someone from a poor background who left school without qualifications, quickly became a mother, and worked her way up from being a home carer to union official to frontbencher is truly inspiring. Outspoken and determined, the Birmingham Yardley MP has been making waves ever since she was elected in 2015, unseating a particularly awful Lib Dem. The former Women’s Aid worker left the party under Blair’s leadership, and yet is criticised by some for being outspoken in her opposition to Corbyn. Never backwards in coming forwards, she has been a strong campaigner in parliament for victims of domestic violence and women’s rights, and her book Everywoman is an excellent read. A target for internet trolls, presumably just for being an outspoken woman, Phillips has spoken about going for the top job before. There is no doubting Cooper’s competence, and her election as chair of the home affairs select committee has given her a platform on one of parliament’s key bodies. Whether she would go for the leadership again though is hard to judge. The shadow business secretary and former solicitor backed Corbyn’s leadership campaign in 2015, shortly after becoming an MP, and was promoted to a key frontbench role after Clive Lewis resigned to vote against article 50 at the third reading. She has remained a key ally of the Labour leadership, and would no doubt benefit from this close association. Kendall was the fourth placed candidate in the 2015 leadership contest, but the contest raised her profile, and she is well liked on the modernising right of the party. Is she likely now though? Probably not and, while she may be loved by Progress members, and the subject of some excellent memes, I’d be fairly surprised if she were to even stand again. Perhaps the more likely future candidate from the Progress wing of the party is their current chair – the Wirral South MP was a parliamentary aide to Gordon Brown and has specialised in economic issues. She also led on Syria campaigning in the commons after Jo Cox’s murder, and has spoken movingly on the need for Britain to fulfil its humanitarian duties in the war-torn country. Whether she could get support from across the party though is hard to judge. The Walthamstow MP has proven herself to be one of the most effective backbench operators in her seven years in parliament – getting legislation changed on payday loans as well as recently forcing the government to extend reproductive rights to Northern Irish women in England and Wales. Creasy came a strong second in the 2015 contest for deputy leader, and while she has not served on the frontbench under Corbyn, her campaigns have been popular across all the party’s factions. Currently atop the Iron Throne in soft left memes for socialist teens on Facebook, Nandy is a key figure for those in the Open Labour group of the party. Encouraged by none other than Owen Jones to stand for the leadership in 2015, she didn’t go for it then for personal reasons. Her standing on the left of the party might have been harmed by her backing of Owen Smith in the 2016 contest, but she consistently proves herself as one of the party’s most forward thinking young voices. The much-respected south London MP and shadow sports minister has won over many in the movement with her work in Corbyn’s team. Her connection to her predecessor in the seat Sadiq Khan does her no harm either, and whilst she isn’t talked up much by many, this would seem impossible to think were she male. She is a good speaker and has, in her short time in the commons, transformed Tooting from a marginal to one with a 15,500 majority. Having the title Dr is always a boost too, and her returns to St George’s A&E to carry out a shift at busy times makes clear to the country that she is no stranger to hard work.